Workplaces are quickly evolving due to the growing needs of the businesses to handle them productively. All business enterprises are using modern day technologies and tools to maximize resource efficiency. Hence, time-consuming, mendacities’, and repetitive processes are being removed and their digital counterparts are being placed. One of the integral processes in any organization is Visitor Management Software to maintain the records of the guests, who are visiting the office premises, in efficaciously and suitable manner. For many, it may be just a matter of maintaining or tracking a record but the organizations who understand its actual implications take necessary actions to protect their employees as well as their premises and allow only authorized entry. What Is The Problem In Maintaining Paper Records? Earlier and even today, many companies are manually maintaining the time of sign-in and sign-out of visitors on papers or registers. But do you think it is the right way to do the same? Will it give accurate details? How authentic this data is? Answering all these questions will leave some sort of void space in your mind because actually, it is not 100% reliable. The information that is captured on paper records is not perfect. The noted time of visitor check-in or check-out is not always correct. Above all, these activities are error-prone, costly, and time-consuming approach where they also potentially compromise the security. Organizations that are still reliant on paper-based visitor management system generally miss capturing many vital points or steps with a sudden visitor’s influx and hence safety measures get compromised. What Is The Visitor Management System? 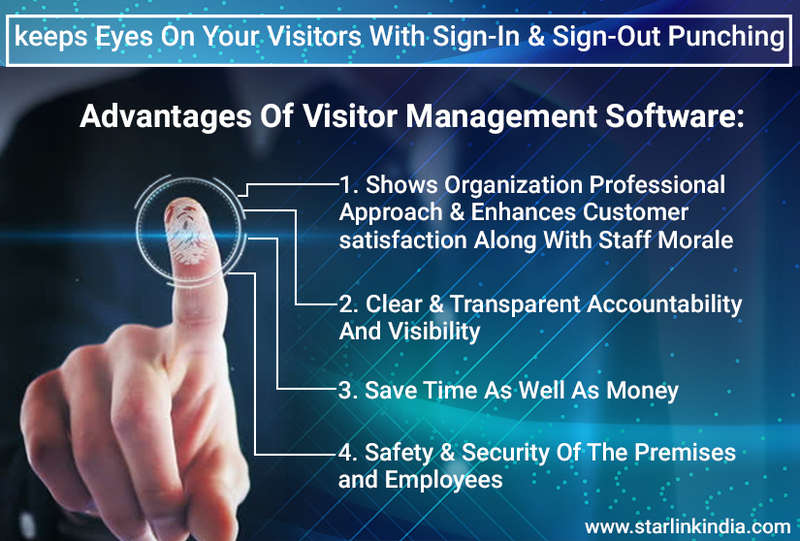 A Visitor Management System, as the name implies, takes away the hassle of a messy & hard manual process of maintaining the records of visitors on papers. Visitor Management Systems is a web-based system, that offers a very efficient and effective way of registering the visitor’s check-in and check-out properly and accurately with complete details. They also help in safeguarding all the data, records, and information of the people who visit the premises. How Visitor Management System Works? These web-based systems are easily accessible anytime from anywhere, irrespective of your current locations as it offers Multiple USER log-in. Generally, three types of levels or logins are available, Admin, Employee, and User i.e. a security guard. Admin owns all the rights under which he can add a new employee who can send the request to gate entry for the visitor. Once an authorized employee makes a request in the system, it goes to the user i.e. security guard at the gate, who actually authenticates the request when the visitor arrives. No one is allowed to enter the premise if no request entry is found for the respective visitor. In this way, a visitor management system is a totally secure process for managing visitor’s entry. It is an integrated and centralized system, so visitor can be managed by multiple gate entry and admin or any other authorized user can see all the records of the visitor in/out details and the ones who are yet to come. This way the company holds full control on guest’s visits. All visitor management systems are equipped with in-built Camera in software, which helps to record the physical identification of the person along with other detail, this way the greatest level of safety can be ensured. Admin can also generate the reports such as User log-in, the number of visitors for a particular period, who has generated the request, etc. with the Report Generation tool. Pre-registration of the visitor is one of the key factors in Visitor Management; a visitor doesn’t need to wait unnecessarily at the reception. This way positive credibility and professionalism of your business get visible to guest and helps to create a long-term relationship with them. All pertinent details are bought beforehand to pace-up the process, that help to avoid the last minute rush or hassle. With a visitor management system in place, you know who is making a request and who is going to visit with proper details, this way process visibility and user accountability becomes authentic. Automatic and streamlining the visitor management ability reduces the need for paper-based systems, which is time-consuming and also requires money. The safety of your organization facilities along with protection of your employees is extremely important. A Visitor Management system offers security by figuring details of visitors accurately. All-in-all Visitor Management System offers several benefits to the organizations as a whole. This needs to be placed to ensure the effectiveness of the process and operational efficiency.